Media captionToned-down Trump: What happened to the tough talk on Paris? French President Emmanuel Macron said he "respected" Donald Trump's decision to pull out of the Paris climate accord but that France would remain committed. The US president said last month that the US would withdraw from the 2015 Paris climate agreement, citing moves to negotiate a new "fair" deal that would not disadvantage US businesses. Has Trump changed his mind about Paris? Mr Macron said it was right to put the climate issue to one side while the two leaders discussed how they could work together on other matters such as the ceasefire in Syria and trade partnerships. "We have disagreements; Mr Trump had election pledges that he took to his supporters and I had pledges - should this hinder progress on all issues? No," Mr Macron said. Mr Macron and Mr Trump then talked about their countries' joint efforts to combat terrorism and in particular the so-called Islamic State group in Syria and Iraq. "The US is extremely involved in the Iraq war," Mr Macron said, "I would like to thank the president for everything done by American troops in this area". "We've agreed to continue our joint work," he added, "in particular building the post-war roadmap". Mr Macron said that France would seek to "undertake several robust initiatives" to help produce greater stability and "control over the region". 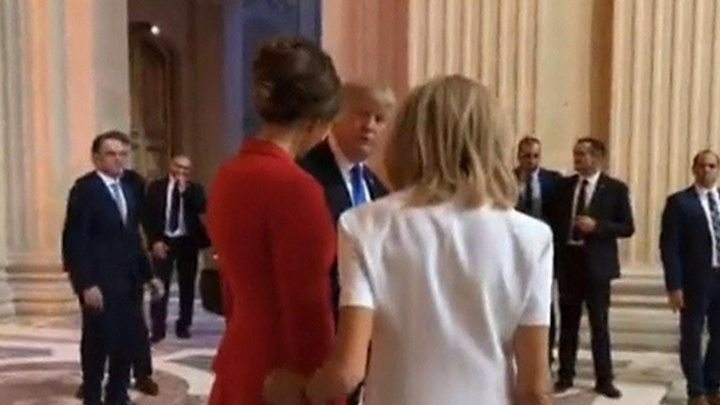 Media captionThe US president told Brigitte Macron she was "in good shape"
Mr Trump, who is in Paris for a two-day visit, was earlier welcomed by Mr Macron with an official military ceremony. The US president then visited the tomb of Napoleon before Friday's Bastille Day celebrations. The trip is aimed at reaffirming historic ties but comes amid tension due to the two leaders' different positions over climate change. Air Force One touched down at Orly airport in Paris earlier on Thursday; Mr Trump and the First Lady emerging from their flight across the Atlantic in an effort to help strengthen US-France relations. "Emmanuel, nice to see you. This is so beautiful," Mr Trump said as he was met by Mr Macron at the Hotel des Invalides, near the site of Napoleon's tomb. 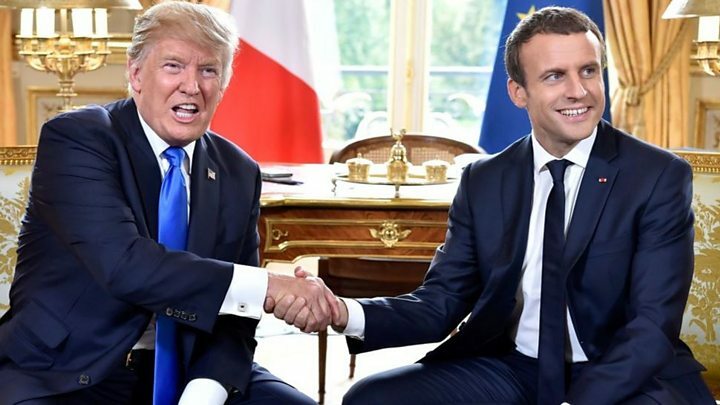 Despite their clear differences, Paris has emphasised that Mr Macron will work to reaffirm historic ties between the two allies to prevent the US from being isolated. Following the ceremony at Les Invalides the leaders moved on to the Élysée Palace. Mr Trump will also dine with Mr Macron at the Eiffel Tower and watch the Bastille Day parade on the Champs-Élysées. This year marks the 100th anniversary of US forces entering World War One, and for this occasion US and French troops will be marching together in the parade. Speaking to the BBC, the former US diplomat and state department official, William Jordan, said the visit was likely to be viewed by Mr Trump as an opportunity for the US president to be "taken seriously in the world". "I think that there's a lot of symbolism in this," he said, adding: "I doubt that there's going to be very much more beyond substantive discussion." Demonstrations are expected. French protesters have planned a "No Trump Zone" at the Place de la Republique. The Facebook page for the event states: "Trump is not welcome in Paris". Mr Trump's visit comes amid fresh allegations of Russian interference in the 2016 US presidential election, with his eldest son admitting he held a "nonsense" meeting that had promised Russian government information about his father's democratic rival Hillary Clinton. Mr Trump has since described the mood in the White House as "fantastic" and told Reuters that the administration was "functioning beautifully".